So Youth Day falls on a different day in July this year but sadly, it won't make a difference for us parents as we will not have the luxury of yet another long weekend. Sigh. BUT do not let that stop you from bringing the kiddos out this weekend because it is yet another weekend full of fun, fun fun activities! A virus was stolen and modified, turning people into zombies. Luckily, Professor X left clues to find the vaccine. 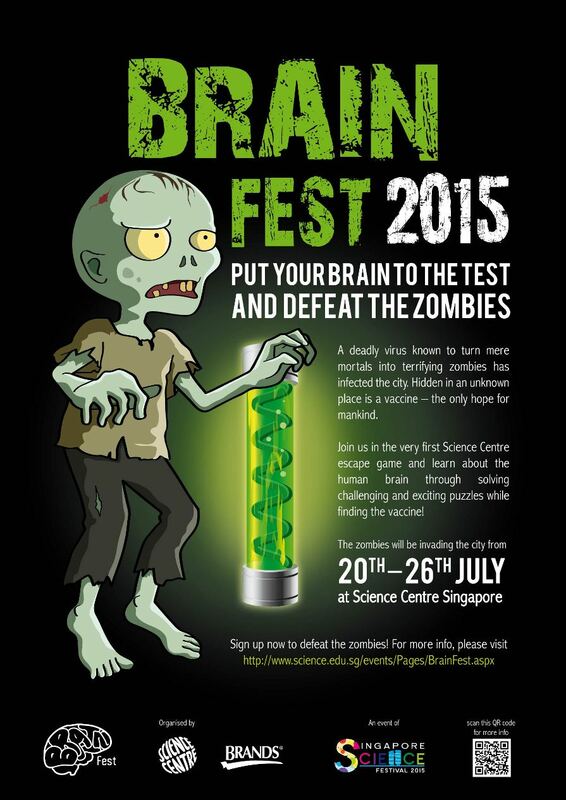 Solve puzzles to find the vaccine before you turn into a zombie! In this inaugural Brain Fest, put your observation, communication and problem solving skills to the test and go on an exciting, challenging and educational mass escape game experience! Through puzzles that revolve around the human brain, learn about the most complex organ in your body and how it works! Registration is compulsory. For more information and to register, visit HERE. Re-live what it was like in school in the 60s and make new discoveries about school today through interactive displays, mini games and artefacts from the past! Pig Out 2015, an outdoor barbeque event with ‘glorious smokin’ BBQ food’, lets participants eat for a good cause. Features for this event include a whole hog roast, a live band and a flea market for the adults, and a bouncy castle, popcorn and candy floss for the kids. Food and drink vouchers will be sold and net proceeds will be donated to The Food Bank Singapore. For more information, visit www.pigout.com.sg. Make your mark on a 1.5m tall lion dance head with bric-a-brac donated by the haberdasheries of Kampong Gelam. Become a virtual character and change costumes as you move, in this special installation by media artist Brandon Tay. Visit the Dian Dancers Studio to sneak a peek at their environment, and try on traditional Malay dance costumes! Psssst… it’s an excellent opportunity to #AliwalOOTD. Suitable for kids aged 4 and up. Colour, make and take home a mask inspired by Singapore cultures, designed by artists ANTZ and ZERO from graffiti collective RSCLs. In this 45-minute workshop, learn the basics of performing with water sleeves – the long sleeves attached to the cuffs of a traditional Chinese Opera costume. YOK!!! is a throwback to celebrations in the good old days, with classic Malay music and dances, specifically the inang and joget. Be captivated by the subtle beauty and grace of traditional Malay dance! The Local People are nomadic space activators whose art markets have now grown into a community where like-minded artists, designers and cooks of all ages share a space and their time for a day. Be mesmerised by famous Singaporean folk tales such as The Wolf Boy of Belankang Mati, Radin Mas and the House of the Merbau, and Sang Nila Utama Lionheart, told by Uncle Rajah to enchanting soundscapes. Visit www.aliwalartscentre.sg/events/aliwalnightcrawl15/ for a complete listing of all activities. 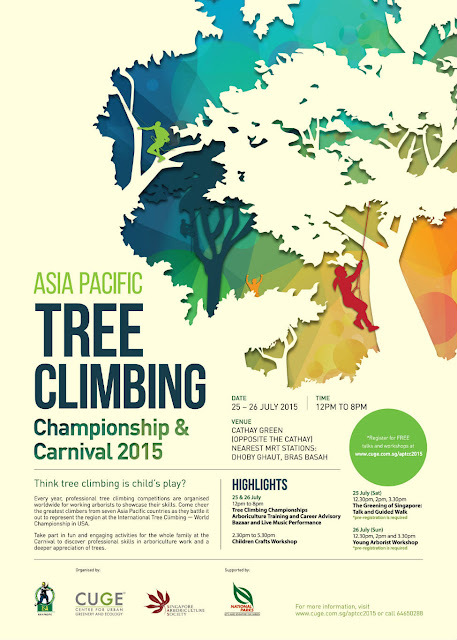 Come show your support for our Singapore contestants at the Asia Pacific Tree Climbing Championship (APTCC) as they vie for the opportunity to represent the region at the World Championship in USA! Bring the whole family for a day of fun and learning. Take part in free talks, nature guided walks and children’s workshops. Be delighted with tantalizing treats at the bazaar and enjoy live music performances every evening. Gardens by the Bay celebrates the vibrancy of Singapore's youth with a series of programmes! Celebrate the vibrancy of youth with at the Gardens! This Band Festival has exciting performances by school bands from all over Singapore lined up just for you. Come and be infected by their energetic performances. Find out more here! Free Admission. YMCA Proms @ the Park is an annual event by YMCA of Singapore to bring cheer to the less privileged and to encourage corporations to give back to society. Members of the public are also welcome to join this carnival-like occasion of music and games*, while having a picnic with your family and friends. Free Admission. *Game prizes and snacks are for invited guests only. Have fun with words! Enjoy the cadences of our four languages in these Poetry Readings, and be the first to listen to winning entries of the National Poetry Festival Competition read by their respective poets. Meet poetry luminaries: Edwin Thumboo, Marc Nair, Ciung Winara, Eric Valles, Desmond Kon, Jayasutha Samuthiran, Nepolian, Noor Hasnah Adam and Tan Chee Lay at these poetry readings. *Admission charges to Cooled Conservatories apply. Catch a riveting performance by the USAF Band of the Pacific! Enjoy an afternoon of popular band music by talented musicians in uniform whose theme this year is “A Salute to Singapore at 50 Years!”. This programme is held in collaboration with the U.S. Embassy Singapore. Get ready for a weekend full of fun for young families! This free-for-all event brings Gumtree offline with a Swap and Shop activity where parents can swap any new or pre-loved baby and small children items such as clothes, books, games & toys to trade-in for new or other pre-loved items! There’ll also be awesome activities and games for the kids including Animal rides, Merry-Go-Round, Bouncy Castle and more! A magician, balloon sculptor, face painter and free balloons will bring smiles to everyone too. For more information, visit HERE. 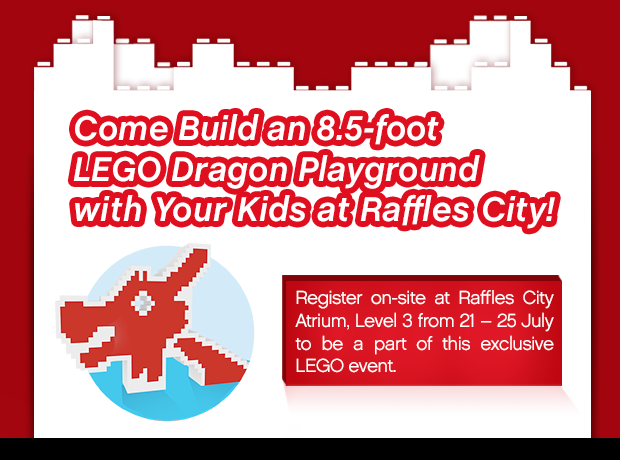 Catch and build with us an 8.5 foot LEGO Dragon Playground, alongside LEGO Certified Professional, Mr. Nicholas Foo, from 21 to noon of 25 July at Raffles City Atrium, level 3! Participants who help to build the dragon playground will receive a certificate. Register on-site from 21 July, and play a part building this exclusive LEGO design. The 8.5 foot LEGO version of the all time childhood favourite - Dragon Playground - will be displayed at Raffles City Atrium, level 3 from 21 - 30 July 2015, 10:30am - 10pm. Members of the Public are invited to build alongside and contribute to the making of this Singapore icon. Winning creations from the LEGO® Rebuild Your Memories Competition will be displayed at Raffles City Shopping Mall (level 1) from 10 to 20 July, and at Raffles City Atrium (level 3) from 21 - 30 July 2015. Told through the magic of song and puppetry, this enchanting play will captivate and warm the hearts of young children and adults alike! 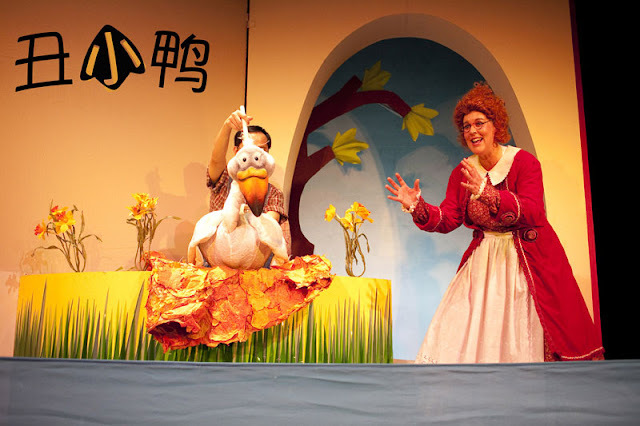 Originally presented in English in 2005 to sold-out audiences, The Little Company is proud to present its second Mandarin production of the year, The Ugly Duckling - a wonderful retelling of the Hans Christian Andersen's classic about a little duckling who looks different. For tickets, visit HERE. A key event of the annual Children’s Season, Masak Masak 2015 returns for its second edition with a variety of interactive and engaging activities for parents to bring their kids to the National Museum of Singapore. There are lots to do, from bouncy playgrounds reminiscent of our familiar neighbourhood mosaic playground, crafts such as traditional woodblock prints, to a massive maze and up-close giant illustrations! Visit HERE for highlights of the event. Come play with us and explore with all five senses. Have fun and make some art of your own to take home. Embark on an exciting trail through the museum to uncover more secrets about animals in art! Look out for our story tellers as they spin Asian tales in the galleries. This specially-curated exhibition for children and the young at heart features interactive ensembles inspired by objects in the collection of the Asian Civilisations Museum that draw on artists' visions of animals in art across many cultures. Recommended for 4 to 9 years old and the young at heart. Brought to you by Science Centre Singapore and ARS ELECTRONICA Linz GmbH, Interplay is the local edition of original ARS ELECTRONICA Festival. The original exhibition from ARS ELECTRONICA Center in Linz, Austria is complemented by local works that similarly reflect the human relationship with digital technologies. 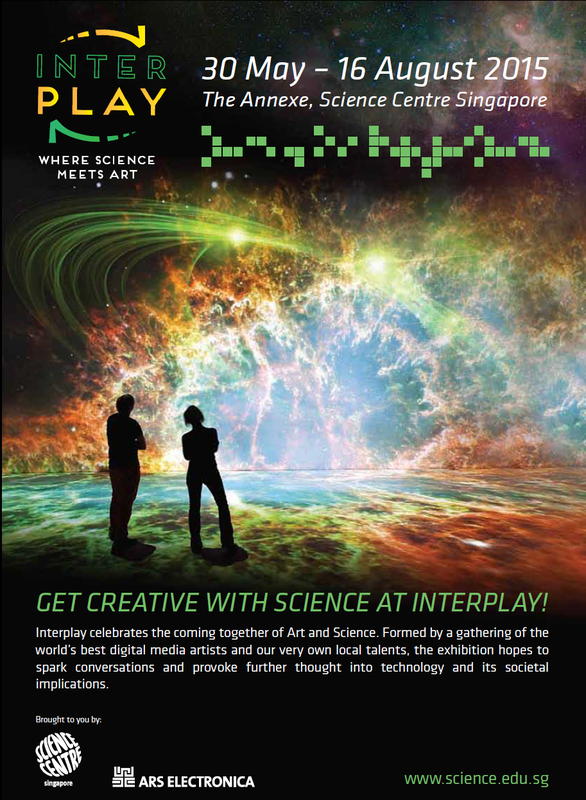 Interplay celebrates diverse blends of artistic genres, scientific domains and technological directions. Fun and interactive exhibits enlighten visitors about humans’ interconnectedness with the digital domain, and provoke thought into technology and its societal implications. For more information on the exhibits, visit HERE. *Check out our experience HERE. The first stop of its five-year international tour, DreamWorks Animation: The Exhibition features over 400 items including rare and never-before-seen concept drawings, models and original artworks, interviews and interactive displays from DreamWorks’ much-loved animated classics. Start with an exhilarating panoramic dragon ride on the back of Toothless through Berk, the Viking township from How to Train Your Dragon. Then, take a fascinating and exciting journey through some of your favourite animated films, from original sketches of grumpy ogres and friendly dragons, to the amazing stories and worlds brought to the screen by DreamWorks’ award-winning artists. Interactive stations throughout the exhibition unveil the secrets of animation and creative filmmaking. Plus, at The Animation Desk, you can learn the basic principles of animation while creating your very own short movie using DreamWorks' software. *Proof of residency will be required when entering the Orchid Garden during this free entry promotion. 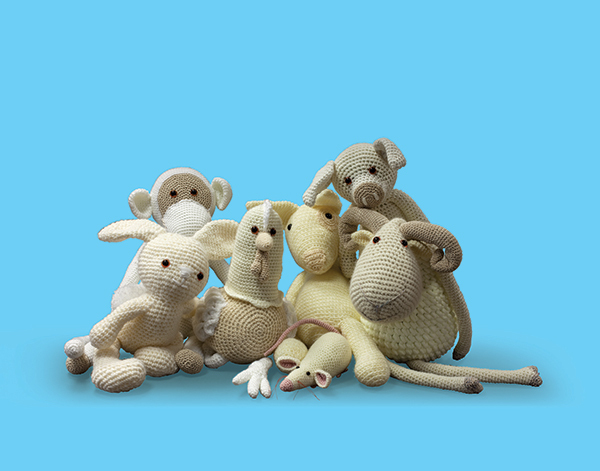 The exhibition aims to bring children into the fluffy, cheeky world of goats and sheep. Here, children get to learn about the small ruminants, one of the first animals to be domesticated. They will meet four-legged friends from different stories and cultures, and get up-close and personal with beautiful goat themed stamps from around the world. For more information, visit HERE. 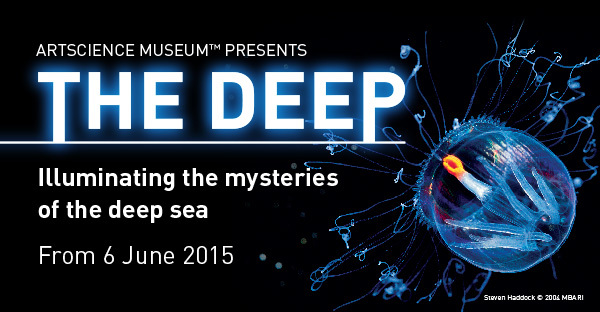 Get up close and personal with rarely seen deep sea creatures from the remotest expanses of the ocean at The Deep exhibition. For the first time in Southeast Asia, ArtScience Museum presents a collection of over 40 exquisite deep-sea life forms, including newly discovered species and exclusive exhibition footage of the abyss. Be captivated by the deep-sea fauna on display and learn more about ocean conservation.